Engravable pendants, bracelets, bangles and necklaces. 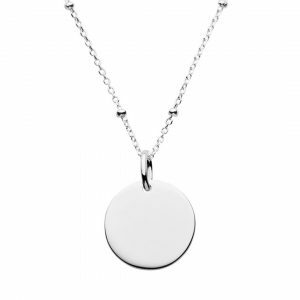 The silver disc necklace is our most popular design – stylishly simple, it is the little black dress of jewellery! 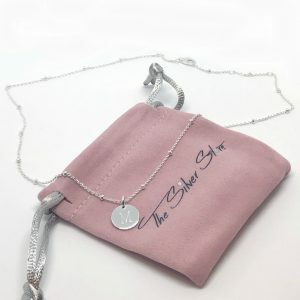 The personalised silver disc necklace looks beautiful personalised with a name, initials, monogram or short special phrase or symbol. Click “START DESIGN” button below to create your engraved jewellery. 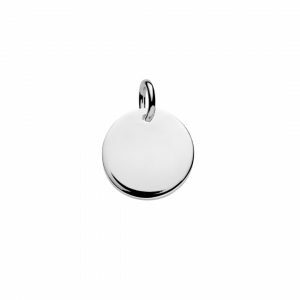 Simple is often the best, we advise no more that 6 shorts words (approx 30 characters) and don’t forget you can engrave on the back of the pendant too. 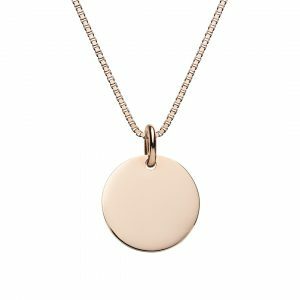 This stunning rose gold disc necklace is very popular. 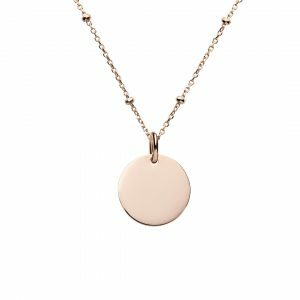 The circular disc pendant and chain are sterling silver plated in rose gold. 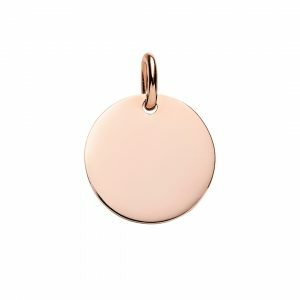 Personalise this rose gold disc necklace by choosing letters, name, message or picture / icon to engraved on the disc pendant. Complimentary engraving & free delivery! Click on the “START DESIGN” button to quickly create your own engraving design and preview what your necklace will look like when it is engraved. Necklace comes with cable chain which is 42 cm in length and can be adjust from 38 – 42c and is designed to sit on your collar bone. Beautiful engraved silver disc necklace with round linked rolo chain. The sterling silver rolo chain is slightly thicker and longer than our cable and box chains. 50cm or matinee length chain can worn at shorter lengths up to 42 cm. Pictured at full length siting mid-chest. 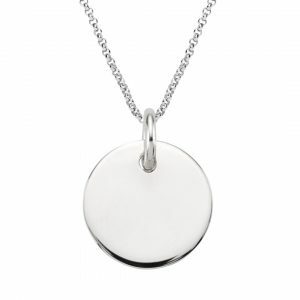 Personalise the sterling silver engraved disc by adding initials, names, special message or images. 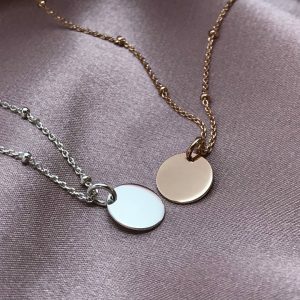 You can add extra disc pendants to your necklace, popular for each child’s name etc. 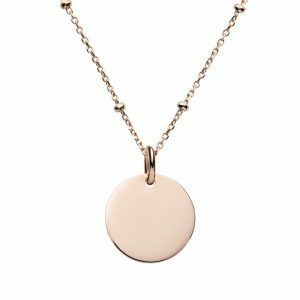 This engraved rose gold disc necklace is a gorgeous piece of jewellery. The rolo chain is longer than our cable and box chains so your pendant can be worn over a sweater and sits below the collarbone. Length 50cm , variable length from 44 – 50cm. 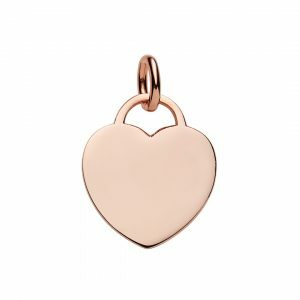 Personalise the rose gold disc with initials, name, date message or symbol. We can also help with custom engraving design if you have something different in mind. Our most popular disc pendant with the new sterling silver satellite chain makes a gorgeous personalised necklace. The chain is 50cm long and can be shortened to 46cm. 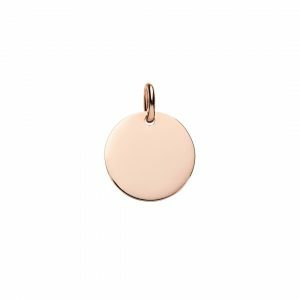 Engrave the 15mm disc pendant with your choice of words or symbols. Perfect for engraving initials, names or dates. Our best selling rose gold disc pendant with the new satellite chain makes a gorgeous personalised necklace. 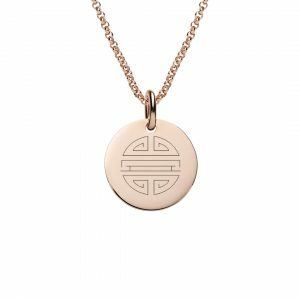 The necklace is solid sterling silver plated with rose gold. The satellite chain is 50cm long and can be shortened to 46cm. Engrave the 15mm disc pendant with your choice of words or symbols. Perfect for engraving initials, names or dates. 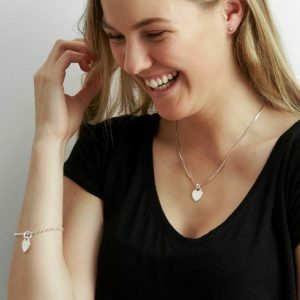 This delicate sterling silver necklace has a shorter length satellite chain and mini disc perfect for engraving an initial or symbol. The necklace can be worn at 3 different lengths from 36 -40 cm and is designed to sit on or above the collar bone. 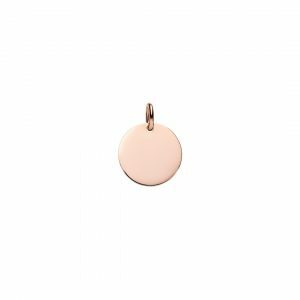 This delicate rose gold mini disc satellite necklace is made from sterling silver and is plated with rose gold. 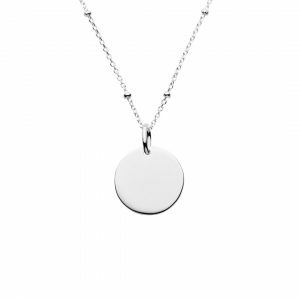 The necklace has a shorter length satellite chain and mini disc perfect for engraving an initial or symbol. The mini disc can be engraved with one word, name, initials or symbol per pendant side. 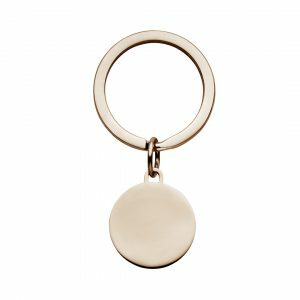 This engraved keyring is a thoughtful personalised gift for men or women. 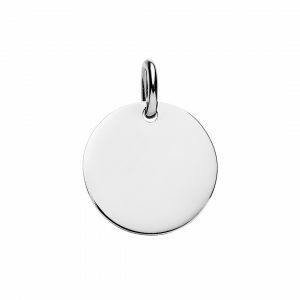 You can engrave the front and back of the disc tag pendant with any name, phone number, special message , initials or symbols. You can also engrave a handwritten message. 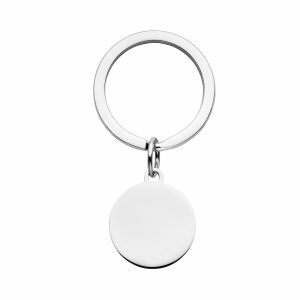 Click the “START DESIGN” button to create your engraved keyring. Made from high shine stainless steel. 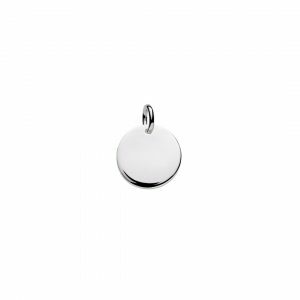 Key tag disc pendant is 25mm wide and the split ring is 35mm wide, total length 6.5cm. 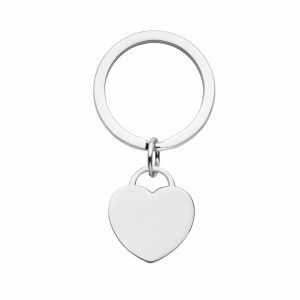 Key tag heart pendant is 25mm wide and the split ring is 35mm wide, total length 7cm. 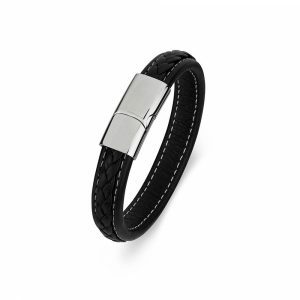 Stainless steel black plaited & smooth white stitched leather bracelet with magnet slide clasp. 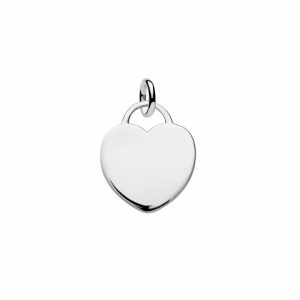 Engrave the clasp with a few words, initials, date or symbol. This engraved rose gold disc keyring is a beautiful personalised gift for men or women. Made from high shine stainless steel plated with rose gold. 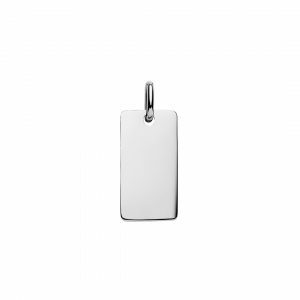 You can engrave the front and back of the disc tag pendant with any name, phone number, special message , initials or symbols. We can also engrave a handwritten message or photograph. This engraved rose gold disc necklace with box chain is a gorgeous piece of jewellery made from sterling silver plated with rose gold that can be personalised by engraving a letter, name, message or symbol. We have over 100 symbols to choose from like the lotus flower pictured. 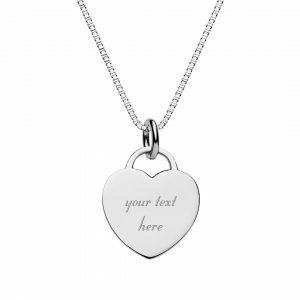 The Silver Store can also engrave handwriting for you or help you create your own custom engraving design. 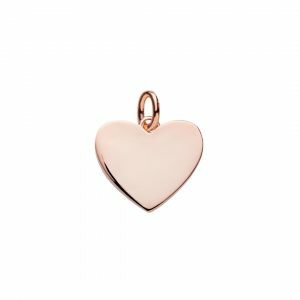 Engrave this rose gold heart keyring with any name, text or symbol. 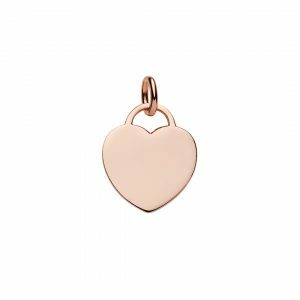 It is made of stainless steel plated with rose gold. 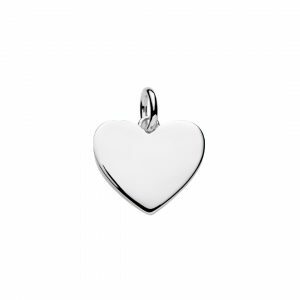 The heart tag is 25mm wide and can be personalised on both sides. 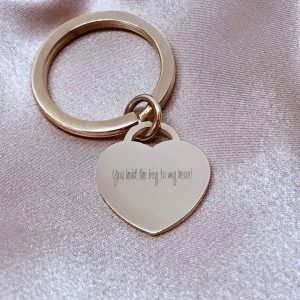 You can also engrave handwriting on the keyring or send us a custom design idea. 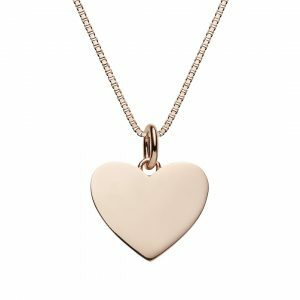 Our engraved rose gold heart necklace with box chain can be personalised with special message, initials, monogram, names or symbols. We can also custom engrave your own design for you. 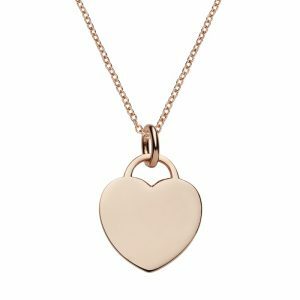 Made from sterling silver plated with rose gold, this heart pendant and chain combination make a gorgeous pairing for a special personalised gift. 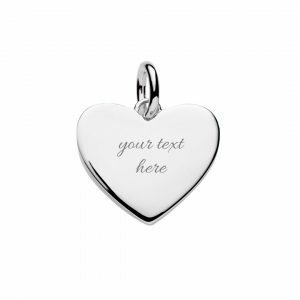 Stylish engraved silver heart tag pendant with rolo chain. 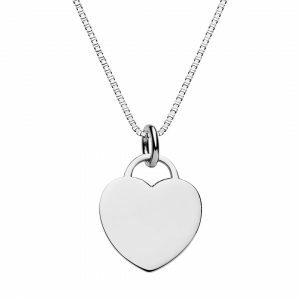 Inspired by the return to Tiffany heart tag padlock this beautiful necklace is timeless. 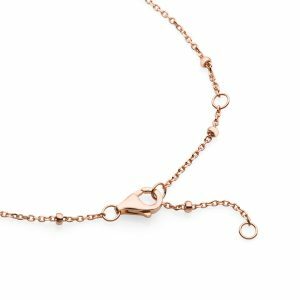 The rolo chain is matinee length (mid chest) 50cm and can be worn at 3 different lengths up to 42cm (sit on the collar bone). 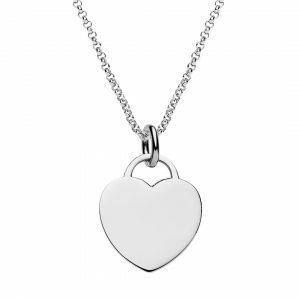 Both pendant and chain are quality 100% 925 sterling silver. 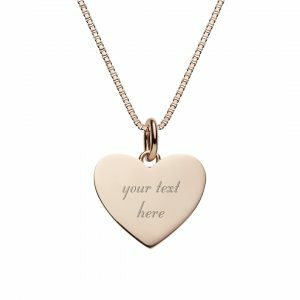 The heart tag can be personalised on both sides with your choice of letter, name, words, dates or choose from 100s of symbols in our engraving designer. 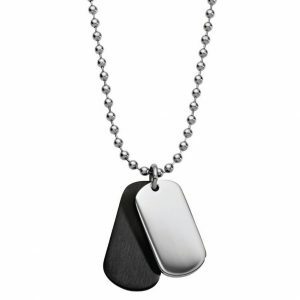 Click START DESIGN button below to preview what your necklace will look like when engraved and place your order. 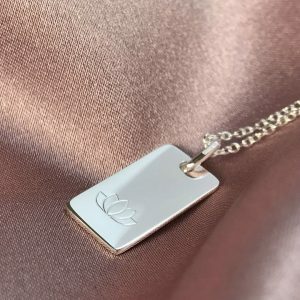 Quality engraving & shipped by The Silver Store in Australia for fast delivery! 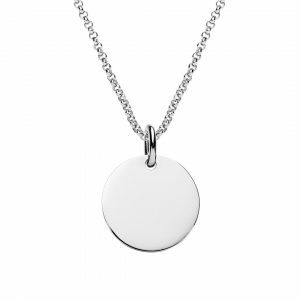 Customise this large disc necklace with any names, text, dates or symbols. 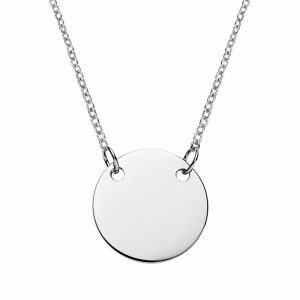 This sterling silver disc necklace has a large 20mm disc that can be engraved on both sides and comes with a beautiful 50cm rolo chain that can be worn at 3 different lengths. We can also engrave handwriting or create your own custom engraving design.